And a Merry [Complete as Applicable] to All of You at Home! Well, it's that time of the year again. No Who Xmas Special this year (only a week to wait, though - here's hoping it's a good'un), but I'm sure that won't stop anybody who wants to make merry on the morrow from doing so. I know it can also be a difficult time of year for many people, so best wishes and greetings of the season to all of you whether you're celebrating or not, whatever you may or may not be celebrating. 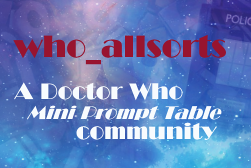 who_allsorts is a prompt table community open to all types of fanworks and all corners of the Doctor Who Universe. It's an old school style prompt claiming community, with bite-sized tables (varying from 3-20 prompts) and a more flexible approach to what can be claimed (characters, pairings, eras, themes, spin-offs etc.). Come on over, claim up to two tables at one time, and create new fanworks for Doctor Who - and everyone profits! Further information can be found at the comm. Click on the banner for link. " I hope you've had a good one and that life treats you well during the coming year. My contribution to the who_guestfest ficathon 2018! Notes/Warnings: Period racism/sexism/homophobia etc. Historical characters taken in vain. 1960s conspiracy-theorising. Summary: Canton Everett Delaware III doesn’t know whether he’s coming or going. Once again I might just have managed to make my posting deadline in *some* time zones. I’ve actually been trying to write this fic, or something like it, for a few years now, so I’m glad the ‘thon gave me the opportunity finally to get it off my chest. Warning for salty language and 1960s period racism, misogyny, homophobia etc. No historical characters were harmed in the making of this fic. Doctor Who and its various characters and copyrights most definitely do not belong to me. 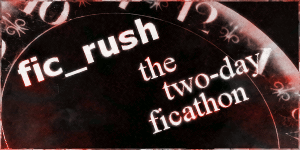 I have many a fond memory of the old fic_rush comm on Livejournal, so it's good to see it being revived here on Dreamwidth. The first round of the new era is this weekend, 17th-18th of March, so why not give it a whirl? Penguins, glowsticks and usurpation usually end up featuring in the proceedings, if I remember correctly. Prompt! Sign up! Write! Post! Do it! Do it..!! I mean, no pressure or anything. You know how it is. You decide to dust off the old LJ after a couple of months of inactivity in anticipation of the new series of Doctor Who (tomorrow, folks, as if you weren't well, well aware of it), and discover that...well, I'm sure you're also well, well aware of the Putin-related Terms of Service unilateral auto-foot-shooting that Livejournal's owners have indulged in. I actually wasn't until I tried to log on yesterday, but I am now. So, in all conscience, I don't actually feel I can continue to post things to LJ. This post, assuming the cross-posting still works, will probably be the last thing, unless the world unexpectedly comes to its senses at some point in the future. I'm not hopeful of this happening, I'll be honest. This goes too for the Who@50 comm, to which I will post a separate announcement. The LJ version of the comm is effectively defunct as of now. It will, however, continue pretty much as normal over here on DW, if normal is the word. Not sure how to announce this on LJ without agreeing to the ToS, so I guess I'm just hoping people see it here on DW. I had planned to be the last person on LJ along with lost_spook. Alas, it was not to be. And may "The Return of Doctor Mysterio" prove to be one of the good Who Xmas specials (although I'm sure they all have their fans and naysayers, it being Doctor Who and everything). Reminder - The Who@50 53rd Anniversary Fanwork-a-thon! 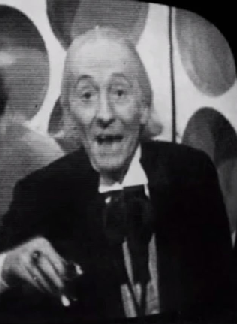 Just a reminder that it's not too late to sign up for the who_at_50 52nd Anniversary Fanwork-a-thon, celebrating more than half a century of Doctor Who-related goodness. All - that is all - forms of fannish endeavour are welcome - fanfic, fanart, fanvids, fanmixes, icons, podfic, and absolutely any other medium in which you want to express your creativity and celebrate your love for that which is Who. If you're interested in taking part, please take a look at one of the posts linked below for details and rules (there aren't many!) and if it looks good please leave a comment. See you there, hopefully. Announcing the Who@50 53rd Anniversary Fanwork-a-thon! The 53rd Anniversary of Doctor Who is looming over us and, as in previous years, I thought it would be nice to commemorate it at who_at_50 via the medium of fanwork. I therefore announce the who_at_50 52nd Anniversary Fanwork-a-thon, celebrating more than half a century of Doctor Who-related goodness. All - that is all - forms of fannish endeavour are welcome - fanfic, fanart, fanvids, fanmixes, icons, podfic, and absolutely any other medium in which you want to express your creativity and celebrate your love for that which is Who, almost certainly including some I've never even heard of. Signups are open from today; posting of fanworks will commence from 1 November 2016 and continue throughout that month. Anything evoking the idea of the extraordinary longevity and diversity of Who would be especially welcome, but maybe the best way to do that is by creating the most typically Doctor Who-like Doctor Who fanwork you can? If you're interested in taking part, please take a look at one of the posts linked below for details and rules (there aren't many rules!) and if it looks good please leave a comment. See you there, hopefully. I think it's fair to say there hasn't been a great deal of activity on who_at_50 this year, entirely down to my not getting around to posting anything. And to be honest, there seems to be less online Who fandom going on in general in recent times. Perhaps it's normal that in a year without a new series of Who there's going to be a drop-off in activity. However, while we're waiting for Class (we are waiting for Class, right, folks?) and Power of the Animated Daleks to drop, and since it's that time of year again, I'm giving some very serious thought to having an anniversary fanwork-a-thon for the comm as in the past couple of years. It would be the usual sort of drill - signups during October, posting in November, relatively informal and inclusive format and rules (basically, make a fanwork - just about any fanwork - post it and receive kudos from all). I just thought I'd test the waters before I announce anything to see whether people are up for it this year. ...to two of my long-time flisters. All of my good vibes and best wishes to both of you, today and for the coming year. I have been somewhat remiss in not boosting this signal earlier, but please, if you have not already, go and have a look at the Obscure and British Commentfest hosted by my associate thisbluespirit - click on the banner to proceed! Very saddened today to hear of the passing away of a very fine actor. I've only really got into Blakes 7 in more recent years (a tad too young to have caught it first time around), but it's very very good indeed and its star for the first two series was a big part of that. Also very good in that one episode of Torchwood and numerous other television appearances over the years. And 71, I can't help thinking, is no age nowadays. My condolences to those he leaves behind. Prompt/Chosen character: "Spandrell — Gallifreyan police procedural." Notes/Warnings: Some violence, descriptions of crime scenes etc. Doctor Who and its many characters and associated copyrights do not – repeat not – belong to me. Summary: A murder on Gallifrey is bad enough; the murder of a prominent Time Lord in the heart(s) of Prydon Academy is even worse. Fortunately, Castellan Spandrell is on the case. As this thing’s actually too long to post to Teaspoon in one chunk as per their rules, I’ll put it up chapter by chapter there, but the whole fic is now up on AO3. Well, new X-Files was on here in Blighty last night, after my months of fevered speculation and anticipation I naturally made sure I caught it. And did it live up to my expections? As ever, for me a pithy comment will never suffice when an epic rambling dissection is an option, and with that Wordpress thingy I started a while back and still haven't made much use of, I thought, why not indeed? Your host, the admirable thisbluespirit, describes it as "a low-pressure, traditional ficathon! Just assign yourself to a date in the sign up post, write a fic of at least 500 words (no maximum) for a minor/guest character (using a prompt or not)..." All I know is that I had a great time taking part in it last year and hope to do so again. If you also are a fan of great times, and Doctor Who, you should seriously consider taking part. Well, it's that time of year again (it comes around so quick!). Whatever holidays you are or are not celebrating, whether or not you're ready for River Song and her husbands, please allow me to extend the best wishes of the season to you and yours. I hope you all have a good day tomorrow, whatever you end up doing. So, I went and watched this obscure arthouse film you've probably never heard of yesterday. And I finally made use of that Wordpress account I started ages ago to record some hopefully non-spoilery first impressions. Perhaps unsurprisingly, I quite liked it.